Manchester City have completed the signing of Brazilian goalkeeper Ederson from Benfica, the Premier League club announced on Thursday. The announcement came a week after Benfica said they had agreed to sell the 23-year-old to City for 40 million euros ($45 million, £34.7 million), making him the second most expensive goalkeeper ever. Ederson will officially become a City player on July 1. City did not disclose the length of his contract. 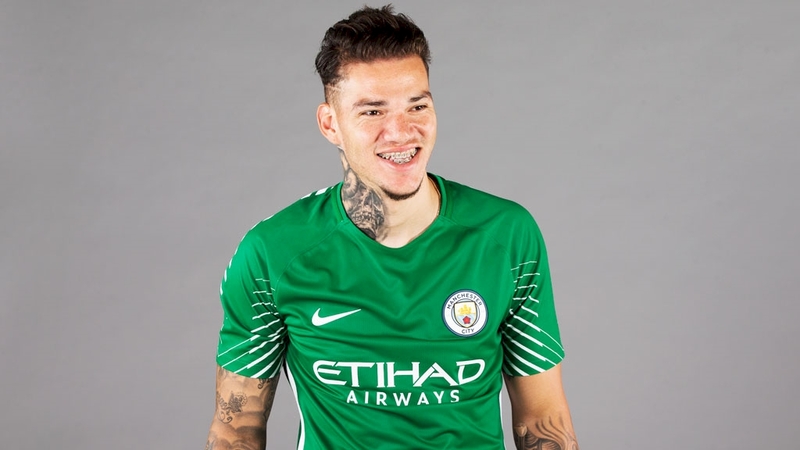 “I like everything about Manchester City,” Ederson said in quotes published on the City website. “This is a great club, they have amazing fans and they play splendid football. I have always had the dream to play in English football and now I’m going to make it true. In signing Ederson, City manager Guardiola hopes to have put an end to the goalkeeping saga that plagued his first season at the Etihad Stadium. Guardiola allowed Joe Hart to join Torino on loan, but Hart’s replacement, Claudio Bravo, proved inadequate and back-up goalkeeper Willy Caballero ended the campaign as City’s number one. Ederson becomes the most expensive goalkeeper since Gianluigi Buffon joined Juventus from Parma for 53 million euros in 2001. He began his career with home-town club Sao Paulo and spent time in Benfica’s youth system before launching his senior career with Portuguese club Ribeirao. After a three-year spell with Rio Ave, he returned to Benfica in 2015. Ederson only became Benfica’s first-choice goalkeeper last season and helped the club to a league and Portuguese Cup double. He is uncapped at senior level, but was named in Brazil’s squad for their upcoming friendlies against Argentina and Australia in Melbourne. “We are delighted to bring Ederson to Manchester City,” said City’s director of football Txiki Begiristain. Ederson is City’s second major signing of the close season following the £43 million ($55.7 million, 49.6 million euros) capture of Portuguese playmaker Bernardo Silva from French champions Monaco. Caballero, Pablo Zabaleta, Bacary Sagna, Gael Clichy and Jesus Navas have all been allowed to leave as Guardiola reshapes a squad that finished 15 points below champions Chelsea in third place.